Who doesn’t like ice cream, rockets, and monsters? Put those three items into an interactive story book app and you have a guaranteed winner! What’s even nicer is that app creator and author, Erik Raj (who also happens to be an awesomely creative SLP), has offered to give not one – but two codes for this new app for me to give away to a lucky reader. I’ll get to the contest in just a minute…right now, let me review the app for you. 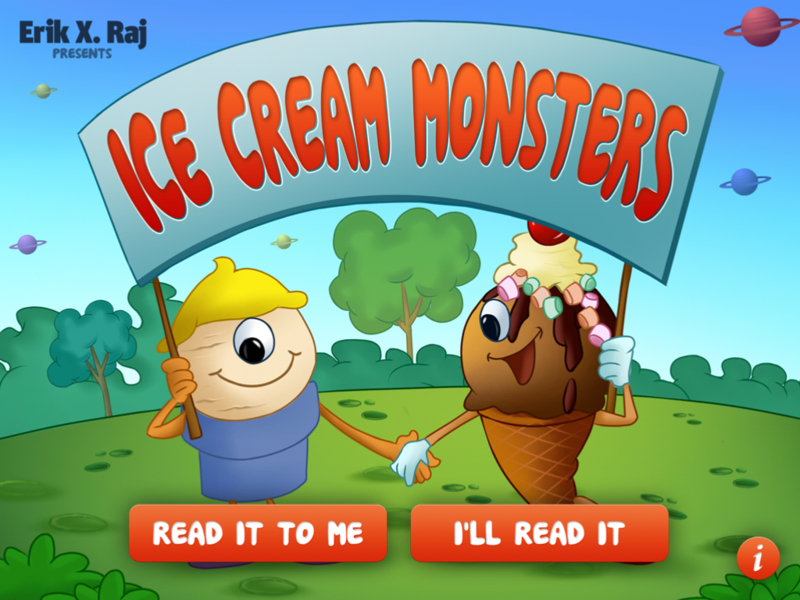 Ice Cream Monsters is a great interactive story book with a valuable lesson. The graphics are engaging and interactive. For instance, the ice cream “monsters” change characteristics with a touch. In addition, there are little things that move (rocket, swing, kite) on nearly every page. The moral of the story is fabulous. The story itself has to do with accepting differences and working together. The story itself is not geared just for SLPs, it’s a great story for all children to learn; however, I can see where the app would be great for teaching a younger class about accepting other students who may be physically or cognitively different. In addition to the obvious moral of the story the app will lend itself to a speech therapy session as well. The app has the potential for being great for language therapy targeting following directions, basic concepts, and descriptors (just to name a few). I can see myself using the story in articulation therapy as well for my 2nd and 3rd grade students who are reading and working on carry-over activities. 2) Leave me a comment telling me the name of Erik’s next app. 3) In your comment tell me how you would use either the new app or Ice Cream Planets. That’s it… I will use a random number generator to choose the two winners and announce them here (and on twitter)…The winners will be announced on Friday 6/29/2012. You will want to check back here so I can tell you who won and get contact information from you. Oh!! I’ll screen comments too so that it’s fair. I hope you all enjoy the app! I look forward to seeing more of Erik’s work. He has some incredible ideas…and if you haven’t already, be sure to click on the “blog” link on his site and follow it. He is easily one of the most creative SLPs I’ve had the pleasure to know. Now…go…play…and win the contest. Be sure to check back here frequently though. I will be having a new contest for Smarty-Ears new Adjective Remix in just a few days. You won’t want to miss the chance to win!!! His new app will be called the Grumble Noise. This would be a great tool to share with parents who have little ones that are having a hard time sleeping at night. It could probably be used like a social story where parents can teach their child that everyone has trouble falling asleep but they can be brave over it! The new app is called The Grumble Noise. It sounds like it would be great to use to stimulate descriptive concepts including emotions. I would include “how would you feel..”, “how do we know this character feels…” I would also possibly introduce narrative skills as the child is encouraged to tell his/her own version of a story about bedtime. I would also look for use with articulation goals. Congratulations Jan! You won a code for Ice Cream Monsters. The Grumble Noise is coming soon. I love to use interactive books at the end of sessions with my 3 year old through12 year old clients. I target concept development, vocabulary, MLU, articulation, phonology, fluency…. (not much that can’t be targeted, really) using text and picture support. I would like to add this book about diversity and acceptance to my toolkit. Thanks for the opportunity. Grumble Noise looks great! I can see a lot of possibilities for therapy….social skills, story comprehension, main idea, sequencing…endless! The Grumble Noise. Likely use for language therapy. Erik’s next app is The Grumble Noise is coming soon. I would use this story to not only build courage and imagination as Erik suggest, but is sounds like it would be good for auditorymemory and sound identification. It might also lend itself to identifying fact or fiction. Erik is working on The Grumble Noise. This app would fit great in my food theme. Plus a way to work on social skills. Erik’s next app is the Grumble Noise. Since I work with mainly pre-schooler’s I would use the app. Ice Cream monsters to help teach tolerance of the “differently-abled” students in the classroom/school. I also think it would be a great interactive tool to help them learn some basic concepts(colors, opposites, simple directions, counting with 1-1 associations, simple descriptors, etc). It can be used to teach pronouns and sharing as well (my turn, your turn) when determining who can turn pages, or move things around on the page. Sounds like a great App. Congratulations Juli! You’ve won a code for Ice Cream Monsters. The Grumble Noise is coming soon! I would use Ice Cream Monsters with my students at school. I think it would fit in well with our overall school philosophy of acceptance, and would be fun to use in therapy.